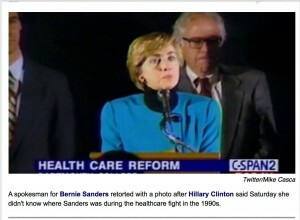 As she addressed her health plans in comparison to Bernie Sanders, Hillary Clinton said Saturday that she didn’t know where Sanders was during the fight for healthcare in the 1990s. 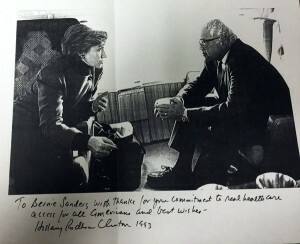 The Sanders campaign, in an effort to jog her memory, provided a couple of photos to refresh it. Above, there he is, standing right behind her in the fight. Below, there he is again, being thanked for helping in the fight. How quickly we forget those who have helped us when we are at odds with them. Clinton would also do well to remember that this is the Internet age and information flies much more rapidly in response to such preposterous allegations.